Westward Ho! On their infamous journey into the newly purchased Western Territories, Meriwether Lewis and William Clark made their way through what is now the state of Montana. 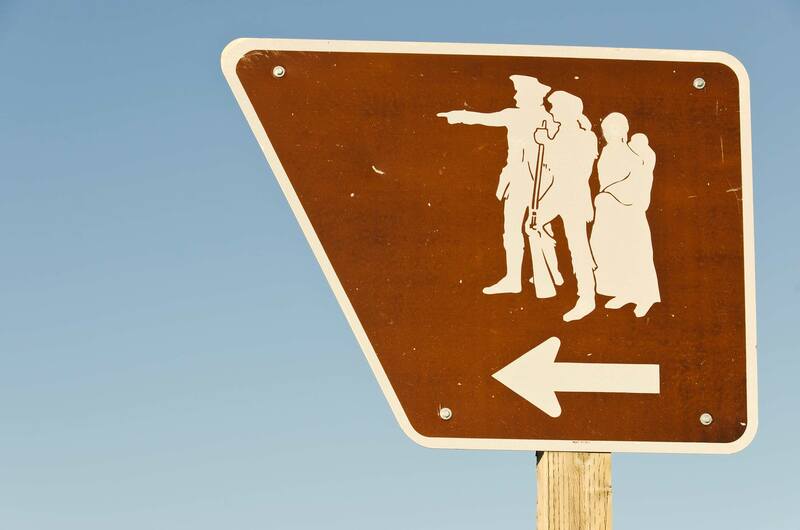 Follow in the footsteps of Lewis and Clark here in Northeast Montana. Many sections of Lewis and Clark’s route through northeastern Montana remain much as they saw them in 1805. On April 27, 1805, the Corps of Discovery first stepped foot into what would become Montana and Missouri River Country near today’s Snowden Bridge near the Fort Union Trading Post National Historic Site (link to listing, under Museums). Lewis and Clark’s adventure-filled historic route through Montana originates and terminates in Missouri River Country. In all, the Expedition spent more time in this state than anywhere else — close to six months. Thirty seven of those days were in Missouri River Country, covering nearly 330 river miles and exposing the Corps to some of the most varied and beautiful prairie country of the entire journey. In May of 1805, the expedition camped just south of the current-day community of Wolf Point. Nearly every animal noted in Lewis & Clark’s journal, except the grizzly bear, can be found in eastern Montana. There are three auto tours for viewing wildlife in the Glasgow area. See preservation pastures with elk, buffalo and antelope. At Fort Peck Lake you’ll find a scenic overlook east of the dam with interpretation for local Lewis & Clark sites. The route of the expedition takes you to some beautiful back country views of the Missouri River. It also takes you to the million-acre Charles M. Russell National Wildlife Refuge. On their journey west, Lewis and Clark spent 13 days within what is now the second largest wildlife refuge in the continental U.S. The auto tour route through the CMR starts 55 miles south of Malta off US 191, the route that most closely follows expedition sites in Missouri River Country. On his return trip up the Yellowstone River, Clark and his company waited here for Lewis, before eventually being chased out of the region by mosquitoes. Many sections of Lewis and Clark’s route through northeastern Montana remain much as they saw them in 1805. Setting their sights on an uncharted west, Meriwether Lewis and William Clark set out to discover a new land and an inland passage to the Pacific Ocean. Accompanied by the Corps of Discovery, Lewis and Clark were determined to accomplish the mission decreed by President Thomas Jefferson. Of the tasks outlined in the mission, the party was instructed to identify suitable sites for trading posts and forts and scientifically document the land’s plants, animals and scenic resources. Much of the success of the expedition would be accomplished within the borders of what is now northeastern Montana. 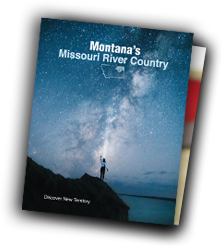 Standing at the confluence of the Yellowstone and Missouri Rivers, travelers to Missouri River Country can follow along in the footsteps of the Lewis and Clark journey through Montana. The journey started here. As Lewis looked west across the two rivers, he first noted this location as an ideal spot for trading. He was right. Years later, Fort Union was constructed and soon became a premier trading spot within the region. It was here that traders bartered with Native Americans and sold their wares. The Fort Union Trading Post National Historic Site stands today and serves as a tribute to the expedition’s foresight and commemorates the fortitude of those who made it happen. Continuing on, Lewis and Clark stood witness to the spectacular abundance of wildlife in the region. Over this land, herds of buffalo, antelope and elk roamed freely. Vegetation was plentiful. The weather was brisk in May and hot in August. Present-day travelers can also experience this land. The river’s reach is relatively unchanged in the eastern half of Missouri River Country, although in the western half the waters of Fort Peck Reservoir cover a number of the campsites used by the expedition. Nevertheless, wild adventurers can witness much of the same landscape seen by Lewis and Clark as they travel along the Charles M. Russell National Wildlife Refuge. Interpretive signs throughout the area enable travelers to embark on a self­-guided tour. To get a sense of the journey, visit one of the communities along the Lewis and Clark Trail, including Sidney, Culbertson, Wolf Point, Fort Peck, and Glasgow. Each year, these small towns and the surrounding areas continue to recognize and celebrate the accomplishments of the Lewis and Clark expedition. Events held throughout the summer include the Fort Union Rendezvous and Fort Union Living History Weekend and a re-enactment of the Lewis and Clark Encampment at Robinson Bridge, south of Malta.